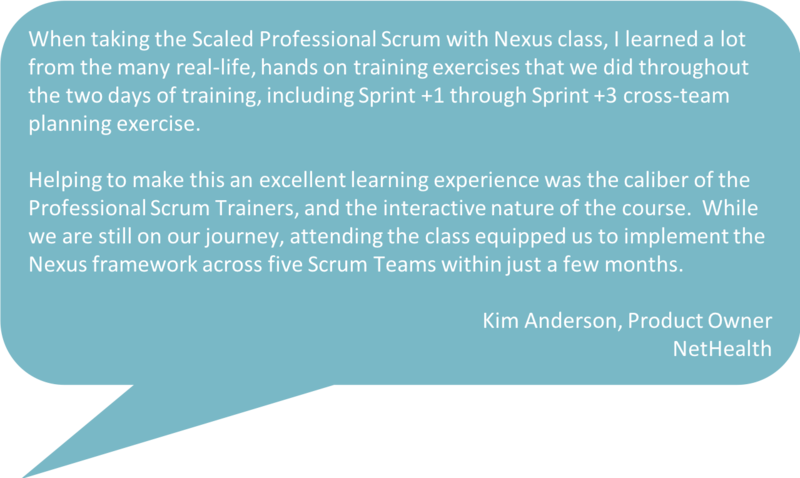 Scaled Professional ScrumTM (SPS) with Nexus is a 2-day course that is designed as an experiential workshop where students learn how to scale Scrum using the Nexus Framework. Throughout, you are introduced to the artifacts and events within the framework, the new Nexus Integration Team role, along with more than 50 associated practices. The course also includes a free attempt at the globally recognized Scaled Professional Scrum certification exam. Over the 2 days, students will simulate a large software development project using the Nexus Framework. The workshop is delivered using an end-to-end case study where students work together to organize and simulate a scaled software development project. Throughout the workshop, students will be introduced to more than 50 practices (find many of the practices here) that can be used to help reduce complexity and dependencies at scale. All participants completing the Scaled Professional Scrum course will receive a password to attempt the Scaled Professional Scrum (SPS) assessment. SPS class participants who attempt the SPS assessment within 14 days of receiving their free password and do not score at least 85% will be granted a 2nd attempt at no additional cost. The industry-recognized SPS certification requires a minimum passing score of 85% and involves understanding of the Nexus Framework, knowledge from the course and of Scrum. All participants completing the Scaled Professional Scrum course will receive a password to attempt the Scaled Professional Scrum (SPS) assessment. SPS class participants who attempt the SPS assessment within 14 days of receiving their free password and do not score at least 85% will be granted a 2nd attempt at no additional cost.. The industry-recognized SPS certification requires a minimum passing score of 85% and involves understanding of the Nexus Framework, knowledge from the course and of Scrum. Students of Scrum.org courses are able to claim Project Management Institute (PMI) PDU credit: 14 PDUs after attending a two-day Scaled Professional Scrum (SPS) course. Please note that PMI PDUs are earned for course attendance and not for passing a Scrum.org assessment. Students can claim PDUs under PMI's "Education courses provided by other third party providers” category. You can claim your PDUs online at https://ccrs.pmi.org.